Governess—The old standby. If you’ve survived a Season or two, if you learned some history and science along the way, perhaps another language such as French, you probably have what it takes to teach other young ladies. 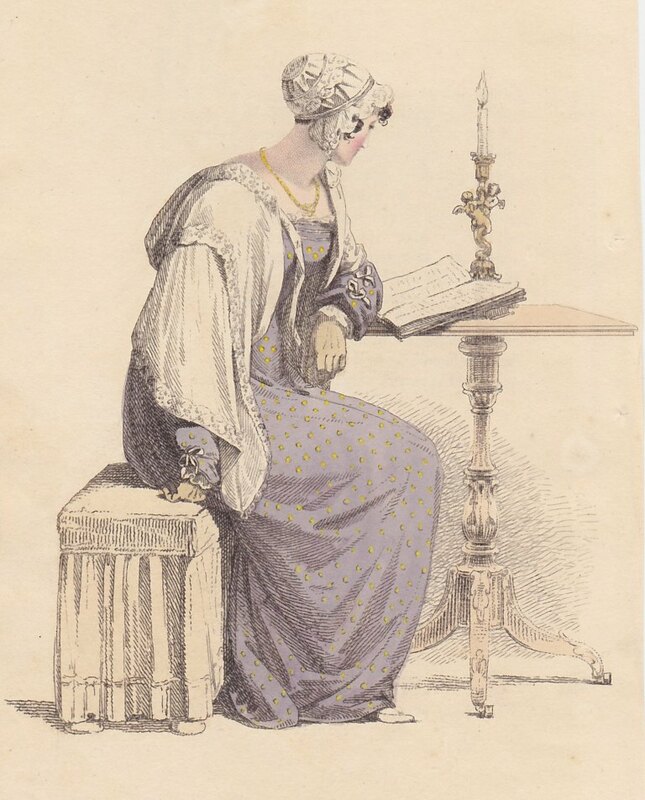 A slight variation on this would be a finishing school teacher, but those were somewhat rare in the Regency (even though I’ve given my heroines that profession in at least two stories 😊). 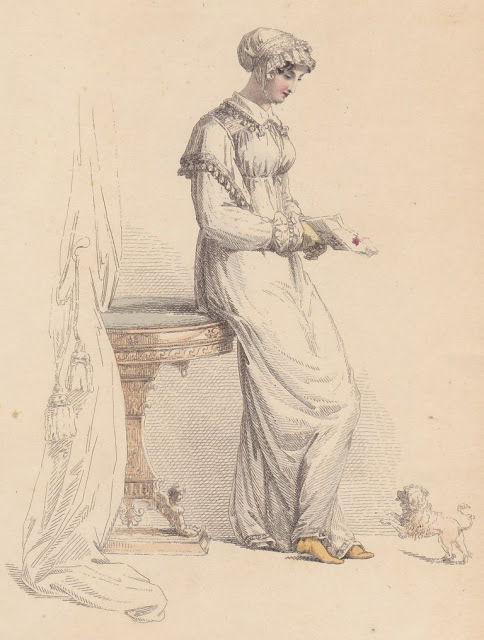 Nanny—I see this frequently, and I’ve certainly used it myself, but I haven’t found too many contemporary sources claiming a young lady who had been raised for finer things took it upon herself to become a nanny. Still, if you had a motherly instinct, if you were raised with many brothers and sisters, and if you were willing to be seen as a servant, you might be able to handle this position. Housekeeper for a relative—this is a difficult one. Technically, a housekeeper is a servant position, although higher on the servant food chain. But if you served a relative who was willing to treat you more like family so that the role was more of chatelaine, this one might do. Lady’s maid—another difficult one. Again, you are a servant, and chances are you won’t be mixing socially with the upper crust. But if you are a dab hand at sewing, know your way around a cosmetic jar, and have a good ear, you could do well here. Companion—another old standby. Families seem to have a plethora of aged female relations who require someone to fetch and carry, to share confidences, to help with daily care and entertainment. And there’s always the off chance that said relative will be kind in her will. 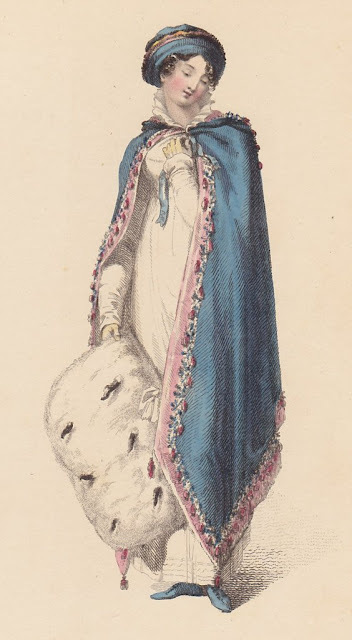 Assistant—I’ll be using this one in my fourth Fortune’s Brides series, but it is a challenging one as well. Secretaries and personal attaches were generally men serving men. A lady really cannot spend time alone with a gentleman. But say a prominent lady, who doesn’t want to claim her age requires a companion or needs specialized skills? Perhaps. Sponsored artist—Sometimes your gift could be your livelihood. 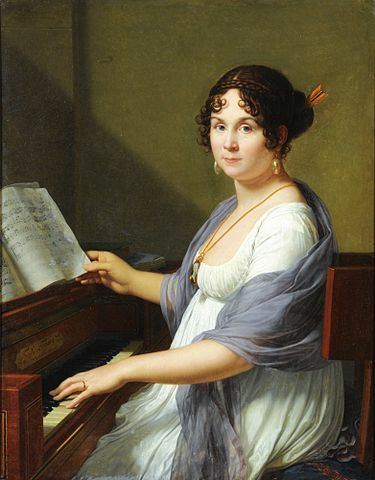 Wealthy patrons might sponsor a painter, a musician, or a composer. Most of these sponsored positions went to men, and it would look odd for a lady to be sponsored by a gentleman. But, under the right circumstances, I could see a woman sponsoring another woman. So, what do you think? Have you heard of other ways for an impoverished young lady to keep her head and her dignity above water? We’ve talked about the some of the most noteworthy public events of 1810, from literary to sporting to true crime...but perhaps the most momentous was what happened in its final months: the descent of George III into permanent debilitation. Everyone’s heard of “mad King George”, and doctors and medical historians have derived endless hours of diversion from trying to figure out just what it was that the poor man suffered from. The most recent thinking seems to be that he was indeed suffering from some form of mental illness, perhaps aggravated by arsenic poisoning (arsenic was commonly used in medical treatments of the day) and not porphyria, a metabolic disease. 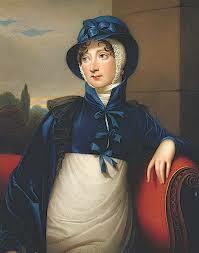 No matter the cause, the last months of 1810 would also be his last months as reigning monarch. First, a little history: the king’s first confirmed demonstration of mental illness began in the fall of 1788, when various physical symptoms (rash, rheumatic pains, gastric distress, and fever) manifested, quickly followed by delirium, hysteria, and mania. He talked for hours on end, making grandiose, delusional plans and pronouncements until he was out of breath and foaming at the mouth. 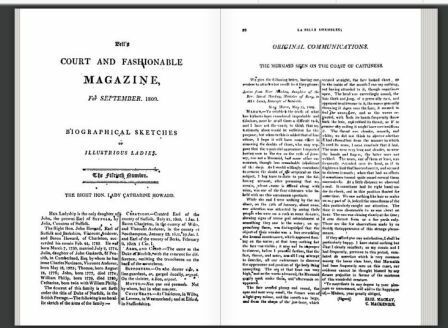 Though his physical symptoms eased, his behavioral ones did not (on November 17 he talked for nineteen straight hours), and between his ministers and his family, plans were made for a regency to rule in his stead...a plan that fell through when, early in the new year, he began to recover and was able by March to call himself mostly recovered. He seems to have suffered a brief relapse in 1794 (though not as severe as the 1788 illness) and again in 1801. After that point, his condition seems to have remained highly fragile, with more relapses and recoveries occurring over the next few years. 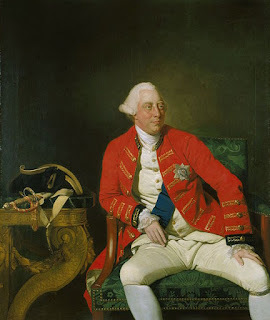 By October 1810, George III was 72 years old and suffering from cataracts and painful rheumatism. He’d been devastated by the deaths of two of his children in the 1780s, while they were quite young. But now it appeared that he would be facing the death of an adult child—one whose very existence had helped him over those earlier losses. 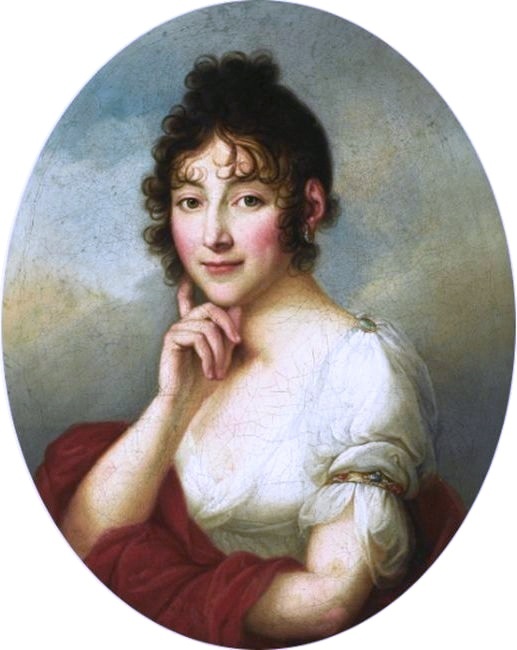 Princess Amelia, his youngest daughter, had been a semi-invalid for years, probably suffering from tuberculosis, and by this time, was on death’s doorstep. The king’s poor eyesight had perhaps cushioned him somewhat from the truth—he could hardly see how ill she was—but toward the end even that could not shield him from the reality of his daughter’s condition. As her life ebbed, his old, familiar symptoms began to reappear: nervousness and excitability, over-talkativeness, sleeplessness. In her last week of life, he too slipped away into a twilight world, and was too ill to comprehend that Amelia was dead. However, it became clear through the spring that recovery was unlikely: while he still had periods of lucidity, the king slipped inexorably into his delusional world, talking and giving commands to people who weren’t there, and seemed to forget his affection for his family. 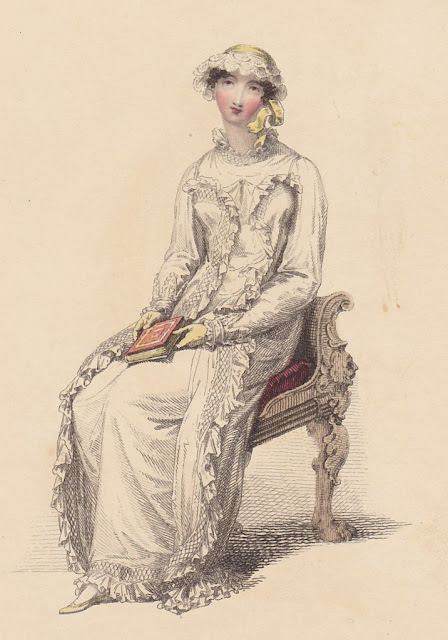 The lucid periods became fewer, and in the fall it was expected that at the one-year anniversary of the Regency Act in January 1812, the regency would be made permanent. Poor King George would hang on for another eight years, growing blinder and sicker, until his death in 1820. 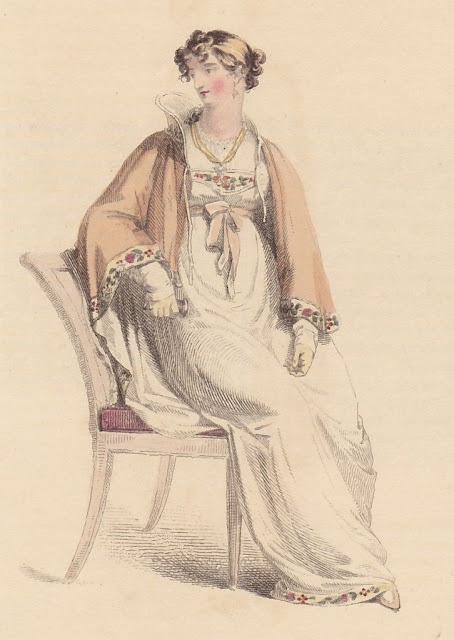 Back in the Regency, that is. For nearly 2 years, all my new releases have focused on frontier Seattle. 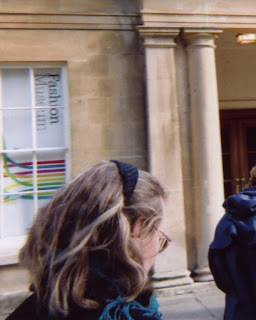 While I loved getting to delve into local history, and there are more stories calling, I have missed my beloved Regency England. 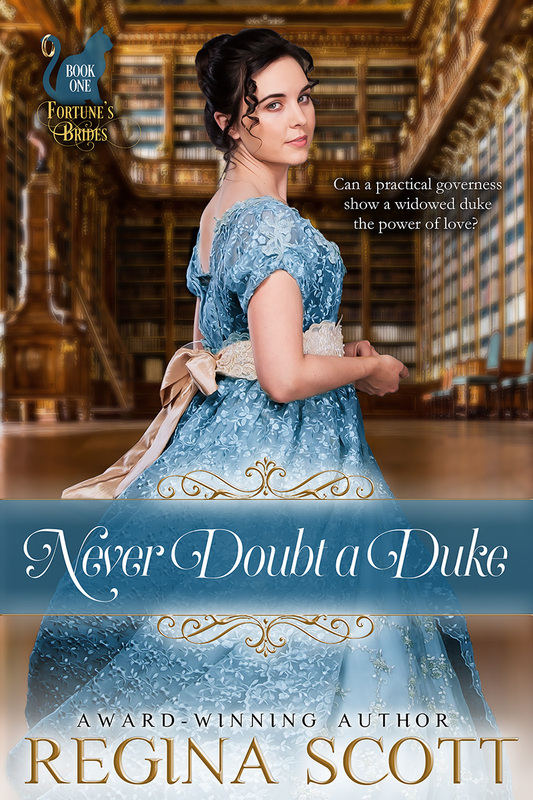 That’s why I’m over the moon delighted to let you know that the first book in my new Regency-set series, Fortune’s Brides, is up for preorder now and will release May 18. 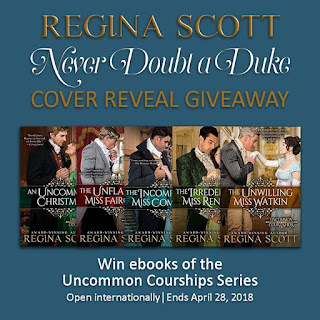 In honor of this new release, I’m running a cover reveal Rafflecopter giveaway through April 28. 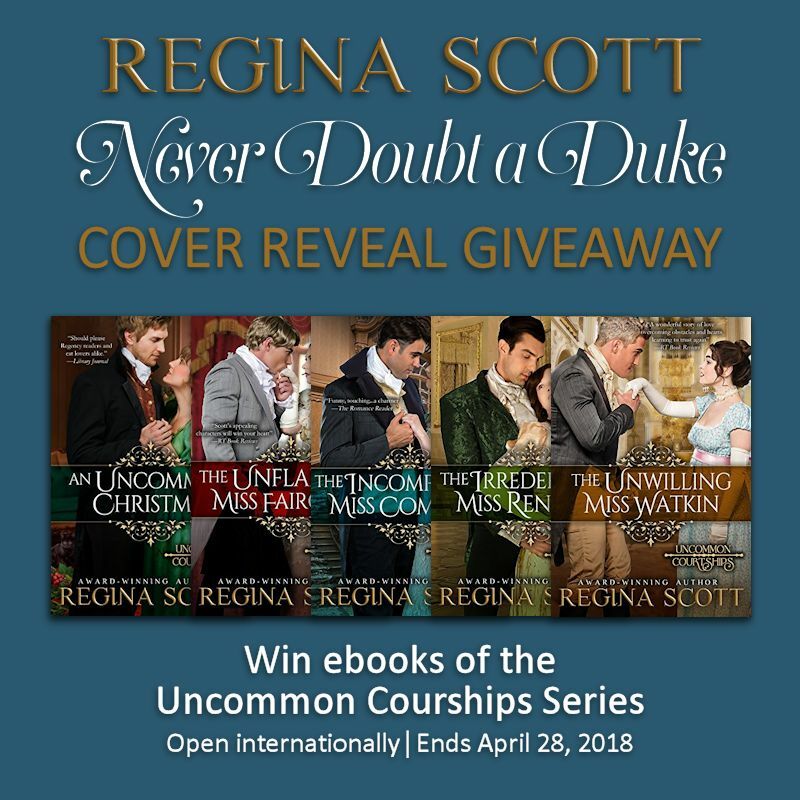 Enter to win an e-book copy of all five of the stories in my Uncommon Courtships series. Regardless, The Unflappable Miss Fairchild, the first in that series is free on all online retailers through April 28. Okay, not really. But this is really cool—you’ll see. As well as publishing the Repository of Arts, we know that Mr.Ackermann designed carriages and owned a print store where he sold prints, paper, and art supplies. He advertised his paper goods at times just as he did those delicious fabric samples we look at occasionally, but most of those ads seemed to occur in earlier issues of the Repository (both of the ones we’ve seen were from 1810.) So imagine my delight when I ran across this paper sample page featuring BRUNELL’S PATENT METALLICK PAPER. Shiny, isn’t it? It doesn’t scan very well—it looks more like metallic camouflage than anything else—but it was evidently pretty snazzy stuff for the time. The gold and bronze-colored papers at Nos. 1 and 2 have help up quite well, but the red one at No. 3 evidently didn’t get along well with the tissue paper covering this plate—it more or less dissolved the paper, which in turn left a cloudy haze on that sample. No. 4, in dark brown, also survived well and bears a good resemblance to tortoise shell. 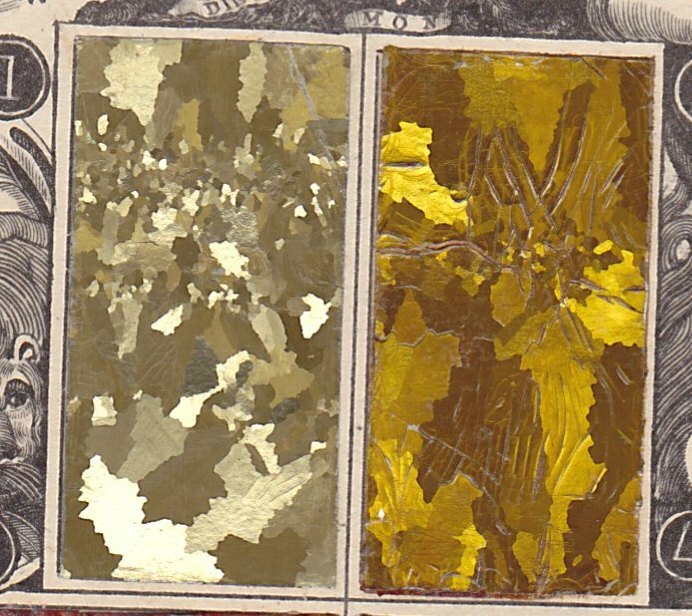 The ornamental crystalization [sic] on tinned surfaces, exhibited in many shops, being confined in its application to articles of the japanner’s trade [japanning being a European form of Asian lacquering], it became a great desideratum to have a similar result elicited on a substance, which, like paper, could be easily employed in covering articles of almost any description. 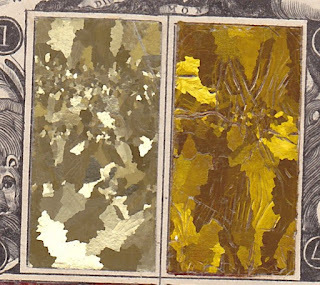 The metallic paper which is now offered to the public, is the produce of a new discovery made by M. J. Brunel, Esq., F.R.S. 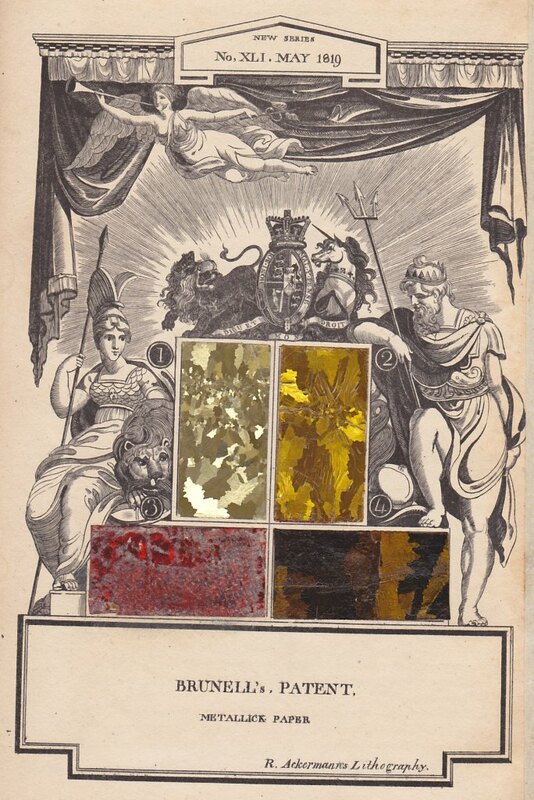 &c.
The matchless beauty of this substance, the character and variety of its crystalization, exceed in effect and brilliancy what has yet been obtained on tin plates, over which it possesses an additional advantage in the dimensions of the sheets, which can be made as large as 4 feet by twenty inches. This metallic paper is now used by skilful artists with great success in decorating apartments and furniture. R. Ackermann, at his Repository of Arts, has introduced it with great taste into a variety of fancy work, where it displays an uncommonly novel and rich appearance. It is sold, in various shades, as seen by the annexed patterns, in sheets of the following sizes and prices: Large, 23 by 19 inches, 6s. ; small, 19 by 11 ½ inches, 3s.—Nothing but a strong paste made of good flour is required to fasten it to wood, paper, &c. &c.
Queen Victoria would eventually knight Papa Brunel for that feat, but it was still in his future...he would first work on a series of not-very successful ventures and wind up in debtor’s prison for a couple of months (and was bailed out by the government when they heard that he was negotiating moving to Russia to work for the Tsar.) I can’t help wondering if this paper might have been one of those projects that led to his stint in King’s Bench Prison...but I also can't help wondering if the enthusiastic crafters of 1819 weren't head over heels with it. I discovered this gem recently when I traveled to the nation’s capital. 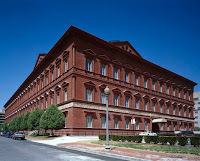 The National Building Museum is run by a non-profit organization set up by Congress. The red-brick façade appears solid and sturdy, but if you look closer, you can see a marvelous frieze showing every type of regiment in the Union army, all valiantly marching around the outside. Still, nothing prepares you for what awaits inside. 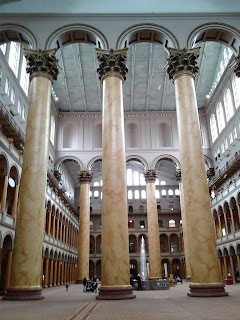 What is now the National Building Museum was originally completed in 1887 to house the Pension Bureau, those hard-working individuals attempting to manage the claims of the hundreds of thousands of men who had served the Union in the Civil War. The order from the government was clear—besides allowing for processing these claims, the building had to have a grand central space for use in civic and social functions. 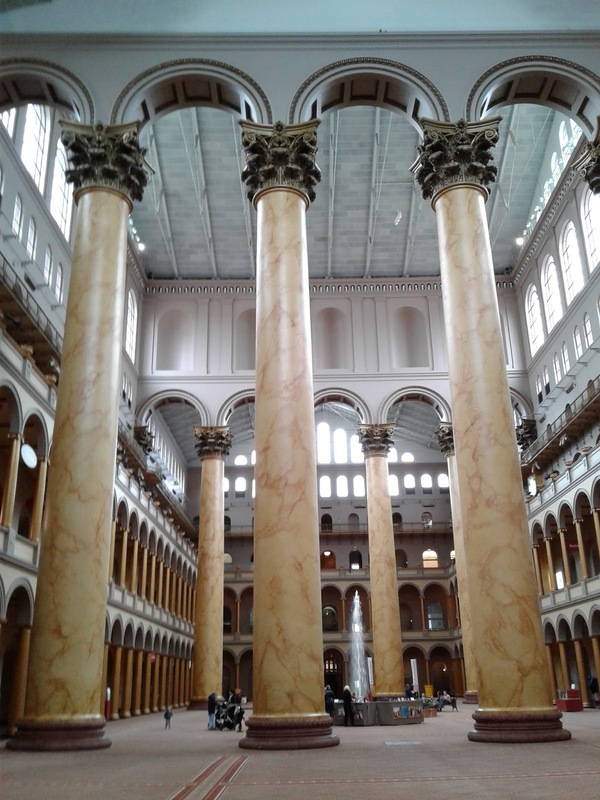 Accordingly, the central space was patterned after an Italian palace, with columns sweeping four stories into the air and a fountain playing in the center. 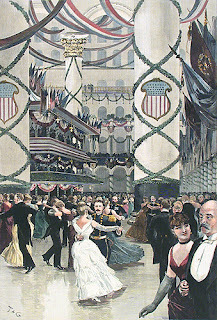 This space was used for a number of inaugural balls in the 1800s. I was fortunate enough to arrive on a day when tours were being given, so I received an inside look at this wonderful national treasure. Here are some of the high points. 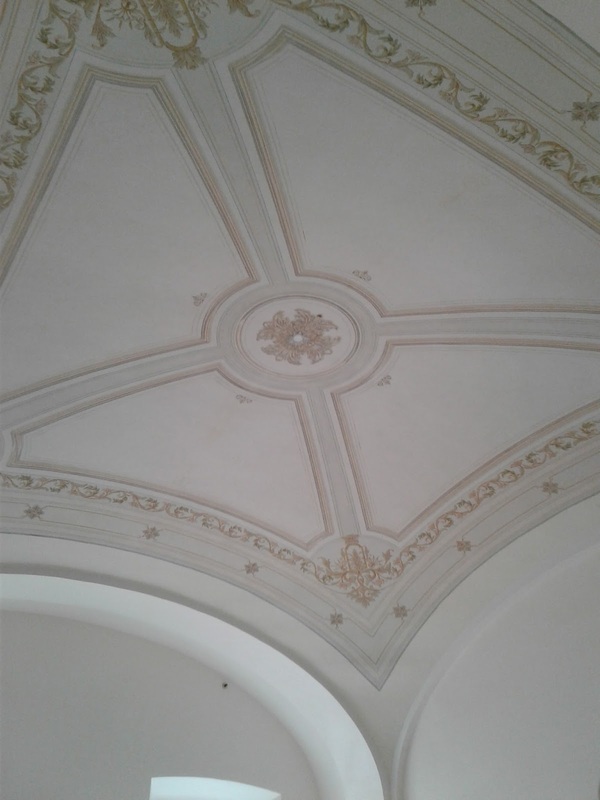 As they were restoring the building, they discovered that part of the director’s suite had this marvelous painted ceiling. It has been cleaned and is being refurbished. 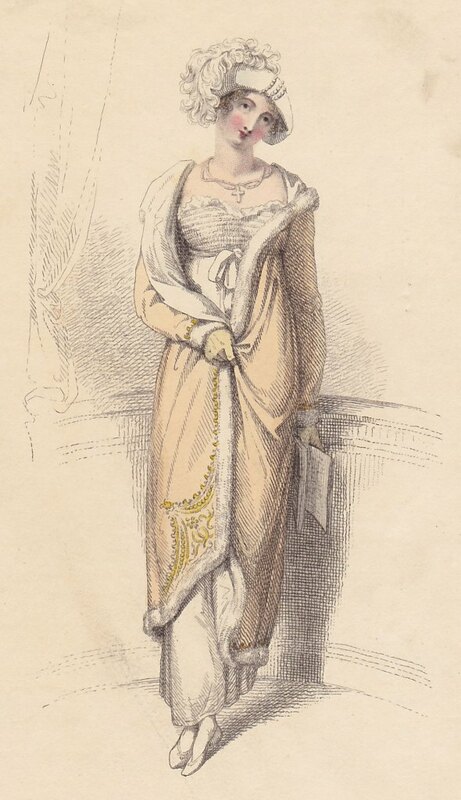 It reminded me of the Regency. A thin metal track runs along the entire ceiling of the walkway along the tippy top floor. Our guide said that when papers must be moved from office to office, the workers would place them in a basket, hook the basket up over the track, and push it along over their heads by use of a paddle until they reached the right office. I stared at her, amazed. They were the first paper pushers! 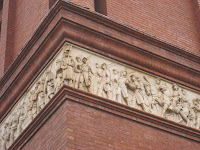 At the very top are alcoves to house the busts of those who had served in the Civil War. 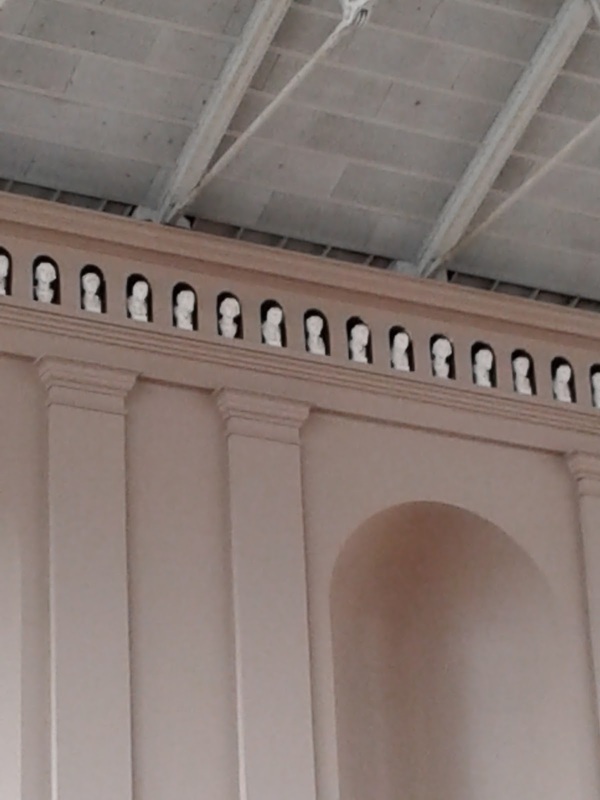 Unfortunately, when the director appealed to the Smithsonian for busts, he was refused. 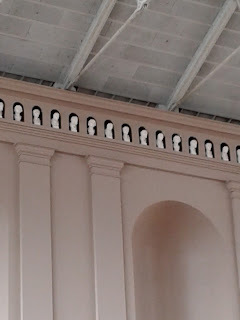 The National Building Museum purchased multiple sets of 8 busts to represent those involved in buildings (architects, builders, etc.). Those are now placed randomly to fill the holes. 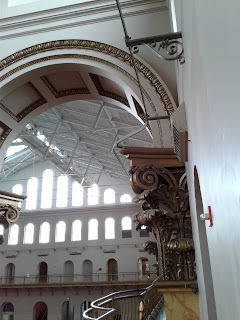 The walkway around each floor is edged with columns that are apparently hollow. This is known because someone carved a hole in one. A special camera was brought in and inserted into the hole to confirm materials, only to find that the column was filled with copies of the Declaration of Independence, newspapers from the 1880s, and other documents. More digging through the director’s papers from the time led to the discovery that he had intended several of the columns as time capsules. He’d reasoned that the building would not stand forever, and, when some future people tore it down, he wanted them to know about the people from long ago who had built it. It has been said it takes a village to raise a child. It takes a team to produce a book too. 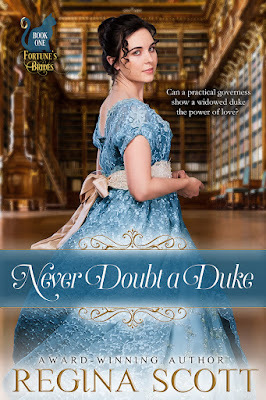 My beloved husband challenged me to finish my first book and encourages me to keep writing. Friends like my dear Marissa celebrate successes and commiserate failures. But through each book, through every plot, every good and bad cover, every praising or complaining review, there has been one person who has always been by my side. For another thing, she does far more than critique. She serves as a sounding board for plots and characters, helps me think through issues, and offers advice about career plans and hopes. She was my guide the first time I went to England (she’d been there before--that's her outside the assembly rooms in Bath). She read every book aloud to me while I checked the text back in the day when we had to hand proof (as in the publisher would send a manuscript that had been rekeyed and the author was responsible for ensuring that every letter had been transferred over correctly). And she serves as my first reader, the one who lets me know when I get it right and when I might have gotten it wrong. She pointed out when my heroine’s eyes inexplicably changed color in the middle of the story. She noticed when my characters bought two horses and somehow rode away on three. She catches typos, grammatical errors, and plot holes (though I try to give her very few of any of these). Because of her love of cats, she’s coaching me through my upcoming series that features a mysterious employment agency owner and her matchmaking feline Fortune. Her support gives me confidence to send my books to a publisher and to let them loose into the world through self-publishing. If you enjoyed any of my stories, chances are Kris helped make it that polished jewel. Today is her birthday. I wrote this post to let her know how much I value and appreciate all her efforts on my behalf over the years. Here’s to many more stories to come, Kristy J. Much love.